What do you get when you cross a Japanese cartoon with an English band? You get a remixed album cover! 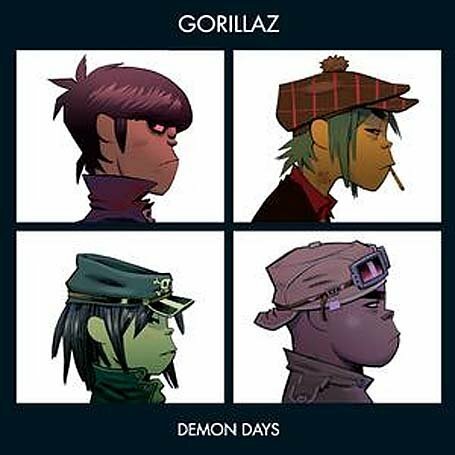 I made this album cover in GIMP by taking the original Gorillaz cover and erasing the text and characters. 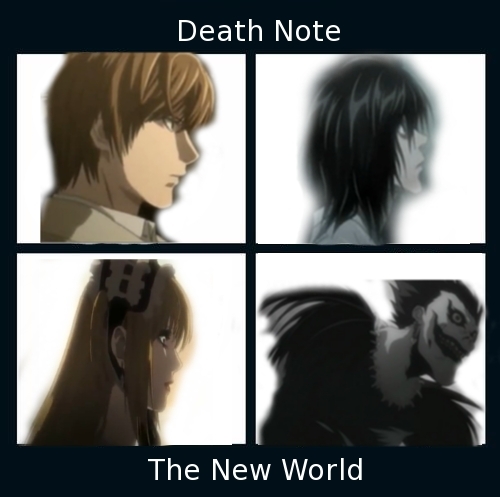 After that I went through a bunch of Death Note clips to find the 4 main characters with a side view, to make it match the original album as much as possible. This was what took me so long because they were always facing the camera straight on in the shot. I fuzzy erased the backgrounds they were in and pasted them in their respective white squares. Hm, I would love to see these 4 in a band, too bad they couldn’t work together since they’d be fighting all the time. In an age where artificial intelligence is becoming more and more prominent, we must become weary of those who walk among us. Who is real, and who is a machine? As the decades go by, it will become more difficult to answer this question. Your best friend could be a cyborg and you would never know. This activity was done for the “For the Remix” assignment. 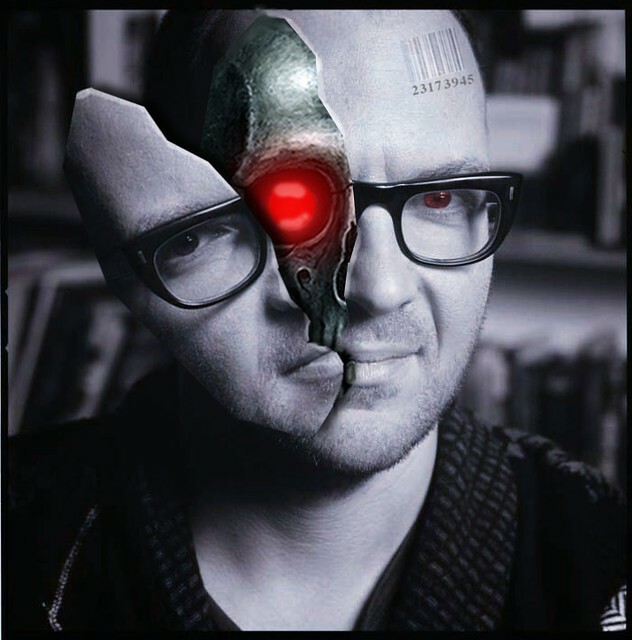 I made this image using a portrait from Jonathan Worth’s website, Creative Commons images of a metal skull and bar code, and GIMP. First I turned the whole image’s color to a silvery-blue to try to mimic the dramatic lighting found in a Terminator movie or something. Then I selected half of his face, cut it away, and pasted it as a new layer. Making it a new layer allowed me to freely rotate the piece without messing up the rest of the face. When I rotated it, I wanted it to look like half of his face was breaking open like a pinata to reveal his metal skull. I had ALOT of fun making this and I was impressed with how it turned out. My first idea was to open his head and inside there was going to be the inside of an apple, symbolizing knowledge. But that would’ve been too easy and I went with something much cooler. I mean, would you rather have a fruit for a brain or an advanced piece of technology that could grant you the power to do unimaginable things? Yeah, I thought so. After 3 days of thinking this week, I’ve finally discovered what I wanted to do for the final project! Throughout my 13 weeks of being apart of this class, I believe I’ve mentioned something My Little Pony related a good number of times. I’ve decided that this final project will be no different! Ladies and gentlemen take your seats and prepare to admire the crazy adventures of the fastest, toughest, and most energetic pony in all of Equestria, Rainbow Dash! Okay so here’s the plan! I want to make a mashup of Rainbow Dash’s best scenes and have them explain how her determination and spirit brought her to the top of her class. Sort of a zero to hero kind of tribute. The forms of media I plan to use are audio, design, and mashup. 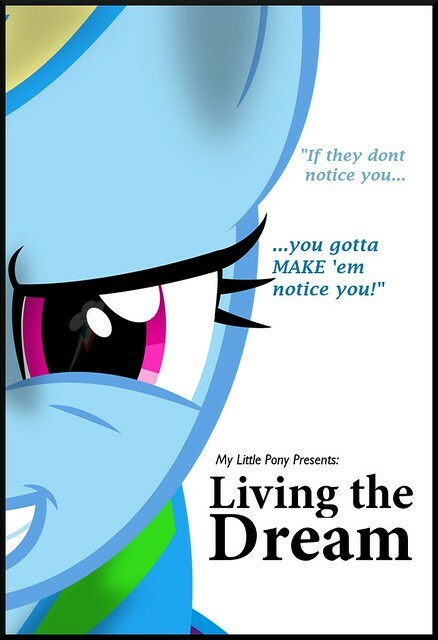 For the design portion, which I already got a jump on, I created a movie poster to advertise the “movie.” I made it in GIMP and used a vectored image of RD looking tough (this image was over 7000 pixels tall so naturally it crashed my weak browser when I opened it,) a picture of her cutie mark to go in her pupil, and a black border to wrap it all up. I also used one of her most known quotes that pretty much sums up her personality. The white background may not seem elaborate, but the video will be the complete opposite. In the video, there will be multiple clips of RD demonstrating her agility, quickness, determination, and overall awesomness. Along with these clips will be an immense amount of flashy effects to lead her flashy flying moves. Actually there’s this image distortion effect that I’ve been dying to try that makes the video seem “ultra wide screen,” like the screen encases itself by extending farther on both sides (don’t know how else to explain it, but when you see it you’re gonna LOVE it!) There will also be clips of her ultimate idols, The Wonderbolts, the greatest team of flyers in the land and whom she’d do anything to meet and be apart of. 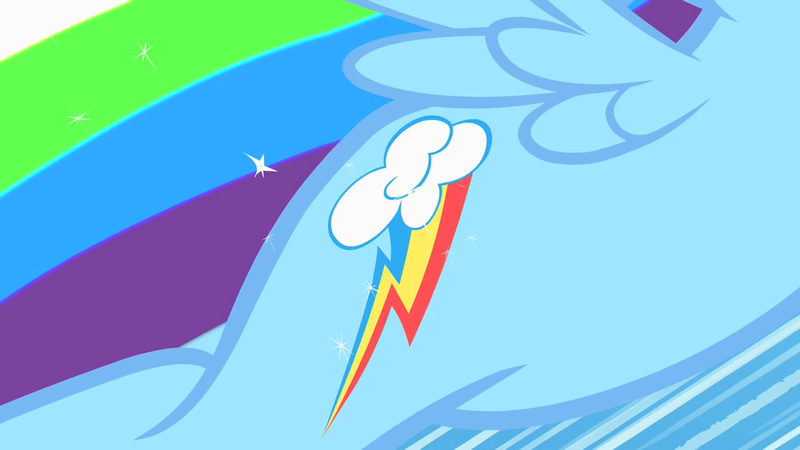 The inclusion of the Wonderbolts in the video will remind us what RD is working toward. For the video’s audio, I wanted to use a fanmade song called “The Wonderbolts Take Flight” by Kristen Cooper. I’m using this song because I personally know Kristen and can get permission to use it without getting sued for copyright or something. Plus this song has just the amount of energy I need without having words. Also, to overlay the music I’m going to have a handful of audio clips from some of the MLP episodes. Since the background music wont have words, you’ll be able to hear them. As you can probably tell by now, I envy Dash’s courage and wish I could be like her, which is why she’s my absolute favorite pony and deserves an awesome tribute!. It’d also be the perfect way to top off the Ds106 experience. I’ve taken 5 pieces of unused media from the Ds106 junked media bucket and created this…I don’t know what it is, but it seems like an awesome party to be invited to!! I mean penguin suits?? Sign me up! Since I still couldn’t get the Popcorn remixing program to work because of the flash player crisis I mentioned in my last blog entry, I had to use Final Cut again (not that I have a problem with it, it just takes a while for things to render sometimes.) I guess the story here is that the people in the pictures have waited all week for this day, and it’s finally here. They must buy all the snacks, prepare their costumes, and put on their game faces because tonight they’re going to stop everything they’re doing and PARTY like there’s no tomorrow! After a loooong semester, the Cogdog himself decides to take a vacation…to the planet Mars! Watch him prepare for the long journey! How he got to Mars with JUST Monopoly money I’ll never know. This is the first remix video that I’ve done this week, and so far it’s my favorite because we can make our professor do silly things through MOVIE MAGIC! At first I tried to use Mozilla Popcorn to remix the video, but the problem was that it wasn’t running properly in any of my browsers. This was because the flash player on the site is a newer version of the flash player that I currently have on my computer. “But Amber, why not just update your flash player?” Welp…turns out the newest version of flash player only runs on Mac OS X 10.6 or higher; I only have OS X 10.5. “But Amber, why not just update your computer so you can get the new flash player?” In order to update my computer, I’d need to order the 10.6 package through the Apple website and have it sent to my parents house 2hrs away from me, since the school’s mail system is very unreliable. The process is extremely long, so I decided to create this remix my old fashion way, with my trusty sidekick Final Cut Pro. The first thing I had to do in the video was to replace his blank laptop screen with a crazy highlight from this semester. This moment deserved the craziest thing I’ve ever done this semester, my Epic Instrument Woman video! Next, he wanted to listen to some tunes on his old fashioned record player. He explained how the song was oldschool, so I had to think “what do I like that’s also from his generation?” I ended up cranking up one of my favorite Mowtown oldies, “And the Beat Goes On” by The Whispers. Very fitting right! After that came some of the tricky stuff. Almost everything in the video that I added was done so by keyframe overlaying, which means you can overlay the original footage and edit each frame’s appearance by timecode. I’m not experienced enough to know how to crop out specifice designs from a rectangular image, other than the left, right, top, and bottom, which is why when I put the Mars image on the map, I couldn’t draw the map around his arm. However, I WAS able to crop out the left side of it when he moved the laptop toward it. This was also done on the laptop for a brief second with the Wikipedia page before the scene switched to the full laptop. This same keyframing nonsense went on for the rest of the video for any of the added images. In order to write on the grading page, I changed the duration of the screen by taking a screenshot of the page. I then used Final Cut’s typewriter function to create 3 typewriter tracks for my name, grade, and evaluation. (The “next Tarantino” joke has been something I’ve been saying the whole semester in my blogs!) The last scene was an actual panorama video of the planet Mars. I took this from a youtube video. Some of you may be wondering “why Mars?” Well Mars is the final frontier and it’s WORTH exploring!! Sure it may take 10 months to get there, but once you’re there it’s a life changing voyage! That monopoly money he used was just enough to get him a round trip ticket, and even a complimentary stop on the moon! Hope he brings back souvenirs and an alien or 2. It’s MOVIE TIME! These last 2 weeks have been very busy, but in the end all 7 of the videos I made gave me something to show for the hard work! Everyone line up at the box office, grab your tickets, grab your concessions, and find a seat in the theater, because without further adieu, I present the Amber E. May Variety Picture Show! I brought the original FOLEY ASSIGNMENT back to life by not only adding sound effects, but also background music and credits! I had it tell an entirely new message by including these new features. Instead of a theme of fear, the scene now comes off as comedic; like sort of a Bugs Bunny episode. Because this was originally a silent film, there could be a multitude of possibilities if one were to re-create the scene with sounds and music. Check out the post for “Charlie’s Great Escape” HERE! And now the first video assignment I successfully created, the “La La La” Animated Dance Party! Out of all my videos, I think this one took the most work. Finding all the anime clips that could sync with the lyrics of the song was tedious. There’s hundreds of animes out there, but I had to figure out which select few could work in the video. Sure enough I found them, and it was one big party! Check out the post for “La La La” Animated Dance Party HERE! And now the 2nd video of the Video Assignment trilogy. This one was one of my favorites because it completely destroyed everyone’s childhood image of the loveable Winnie the Pooh. It features the bear extremely depressed about losing his best friend Christopher Robin (Christopher isn’t dead, he’s litterally lost somewhere!) He has completely given up hope and now views life in a negative manner. Check out the dramatic adventures of “Pooh’s Mad World” HERE! It is now time for the EPIC part of the Variety Picture Show. Think your eyes can handle the epicness of this magnitude? Introducing the one woman show, Epic Instrument Woman! With the power of her saxophone, clarinet, and flute skills, this brave woman eagerly brings good music and joy to a lifeless world! If you feel your eyes are worthy, check out the post for Epic Instrument Woman HERE! This woman is on FIRE! And now it’s intermission time for the picture show. As you’re stretching your legs and talking about how amazing the show is to your neighbor, this video is rolling on the screen. It’s a video of me ripping a piece of paper…but in reverse! Wooooo special effects! I ended up making this in 10min because I was bored. Dont let the shortness fool you! This actually represents the deep manefestations that currently exist in our world and the fact that we must mend them! …okay so maybe I made that up… Check out the intermission “Reverse Rip” video HERE! And now for the Sci-fi portion of the Picture Show! Ever think about what our loving pets think about? Well I have developed a high tech camera that can pick up the thoughts of any animal and convert them to English! Wooooo Science! The test subject of the video is my dog Caesar when he was just an energetic troublesome puppy. Now I know I must be cautious around him because he’s ALWAYS plotting to take over the world one dog house at a time! Check out the thoughts of “Caesar the Tough Puppy” HERE! And now as the final act of the Amber E. May Variety Picture Show, we bring back the roughest toughest dog in Virginia, Caesar! As you can see in the video, he’s past his puppy stage and is now in his emo teen years where he feels the need to ignore anyone who doesn’t understand him. This sort of gives the Picture Show a tear-jerking conclusion where the audience feels for the parents of this socially anxious pup. Check out the rude canine’s quest to find out who he is HERE! And so concludes exciting tale of Amber E. May’s Variety Picture Show! The audience are now on their feet clapping and cheering for the greatness they just saw. A lot of work was put into this magnificent show, from voice acting to the video and audio editing behind the scenes. There were some struggles with deciding what video projects could possibly be done within a reasonable amount of time. At first I had planned to do the “Lip-sync Your Favorite Song” assignment but this week hit me with so many other projects for different classes that I would’ve never got around to it in time. It felt nice being able to dust off my video editing after years of not really doing anything with it. As I said before, I used to make videos like these all the time in grade school. As I was making the Animated Dance Party video, I felt a hit of nostalgia because it reminded me of middle school where me and my friends were obsessed with Anime and AMV’s (anime music videos) on Youtube. Come to think of it, back then Youtube didnt have a high standard for video editing as it does now. Right now audiences expect flashy effects, expensive cameras, and movie worthy plot lines in all the videos they watch. Whereas in 2005 you could’ve uploaded a slideshow with music in the background and it would’ve been an instant hit. I sort of miss those days, but this only shows that more and more people have taken an interest in video editing than there were 8yrs ago. Anyway, now that the Variety show is over, I have to start thinking about an even bigger show, one that will have audiences cheering on their feet for days! I will start thinking about it next week, but until then, watch your step as you’re walking out of the theater, some kids spilled a huge load of popcorn and gummy fish. I tried to match the 5 Second Film style as much as possible by having the same opening/closing font and durations. I used Final Cut Pro to make this rather than iMovie because I needed the exact font layout (Lucida Grande, Centered) if I wanted to stay true to the style. Sadly when I recorded this I was using an IPod Touch, and it was turned sideways. That’s why the irremovable black bars of death are on the sides. I liked this assignment because showed that one doesn’t need a 20min long sitcom to be funny, and that simplicity is all one really needs. 5 seconds could be worth 1000 words! I swear, if I were to read my dog’s thoughts, they would always say something about being the roughest toughest dog in the neighborhood! Well now I finally get to see what this dog is thinking! Introducing Caesar the Tough Puppy for the “What Do Pets Think About” video assignment! Caesar is my Labrador Walker Hound mix and he’s currently 3 years old, but in the video he was only a few weeks old. Caesar was always a tough little guy. This stems back to when he was just a puppy and he would always steal things from the other puppies in his litter. Now that he’s older, you could be sitting on the couch watching TV, and he’d come up and jump on you for no reason wanting to wrestle. He tries to act like a big champ, but he’s just hiding the fact that he’s a total sweetie! I made the video using a mix of iMovie, Final Cut Pro, Garageband, and GIMP. I used GIMP to create the introduction photo using a picture of Caesar trying to jump out of his box. In Garageband, I used one of the royalty free songs called “Vintage” because it sounded really…triumphant! Then in iMovie I uploaded some video that I’d taken when he was a puppy and then did the voiceover there since I could watch the video at the same time to match the voice up. After I created that, I moved the product to Final Cut to add the introduction photo, transitions, music, and outro. Caesar has sort of calmed down as he’s gotten older, and now he’s got another puppy to worry about. That’s right, we just got him a playmate last month named Prince. After Goldie, Caesar’s older playmate died, Caesar was devastated and hated being alone. Ever since we got Prince, Caesar has been A LOT happier, running around playing with him. Sorry Caesar, looks like there’s a new tough puppy in town! This is me ripping a piece of paper in reverse for the “Play It Backward, Jack” video assignment. Um…nothing analytically in depth about this, but I do admit it looks sort of cool. I’m sorry that this reversal isn’t extremely creative, but the reason for this is because, unlike in video editing where anything can be fixed, if I were to damage, spill, or drop something in real life there would be consequences. Its not like I can knock over a glass of chocolate milk somewhere or drop a bag of Skittles and reverse the spill to clean it up (although that’d be pretty cool.) Every action has a reaction, and only with movie magic can it be reversed. In your entire life, you will never see anything as EPIC as this! In the beginning, there was Epic Sax Guy, but now the genders have flipped to reveal something equally, if not MORE epic! I give you, Epic Instrument Woman! This video was created for the “Viral Video Re-enactment” video assignment where you had to re-enact a famous viral video. This video is a parody of the extremely popular “Epic Sax Guy” video, which shows a European pop group singing a song called “Run Away.” The man with the saxophone solo ends up stealing the whole show with his pelvic thrusts, smooth sunglasses, and overall epicness! This part of the song was so cool that someone made a 10 hour version of just his solo. I could sit through it forever! I not only tried to mimic this, but I gave it my own little twist. Instead of having just a saxophone, I whipped out my clarinet and flute to add some variety. The dancing continued through all 3 instruments. I wish I could dance… What I’m wearing? Don’t question that, just gaze upon the epicosity that my outfit is radiating; purple wig, purple shades, purple morphsuit ect. I guess the inspiration for the video was the fact that I planned to create it earlier this month as an April Fools video, just never got around to it. I like goofing off on camera, and I love the sax song, so why not combine them! Unlike my other videos, there is absolutely no message to be learned here, other than BE EPIC for the camera!